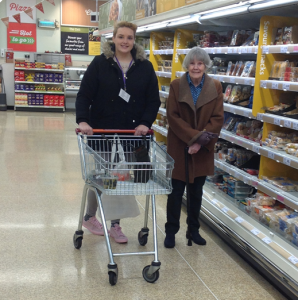 Hambleton Community Action has recently launched a new Shopping Angels service which aims to support older people in Northallerton, Bedale and the surrounding villages to get out of their homes to do their own shopping at local supermarkets and shops. Our Shopping Angel volunteers provide transport to and from the shops, help read labels, reach for items and help pack / unpack bags etc. The service aims to offer a social benefit by enabling people to remain more independent whilst providing them support, much needed company and the opportunity for going for a tea or coffee before or after shopping. Transport is charged at a rate of 45p per mile, plus there is an annual registration fee of £12.00. Mileage rates are calculated from and back to the volunteers home, and are paid to the volunteer. There is a minimum charge of £2.80. For further information about the service or if you would like to apply to use this service then please get in touch to request an application form. Alternatively if you could help by becoming a Shopping Angel volunteer, please complete the application form here call into our office, telephone 01609 780458 or email admin@hambletoncommunityaction.org. This scheme has been launched with help from the Two Ridings Community Foundation (TRCF) A Life Less Lonely fund.